your contract is rain transfers. 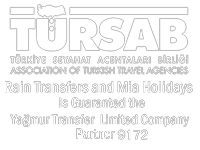 our registered office is at marmaris mugla türkiye and our company number is 0090 252 417 83 05 please read these terms and conditions carefully before making any booking, as they contain important information about your rights and obligations and you will be bound by them. If we receive your cancellation request more than 48 hours before the scheduled pickup time of the Transfer Service you wish to cancel, the amount paid for this transfer will be refunded in full, No monies will be refunded for cancellations received less than 48 hours from the scheduled time of the Transfer Service you wish to cancel, In these instances we will email you a cancellation note which may be used to claim the expense back against your tour operator, airline, or travel insurance provider. 1.1 please read these terms and conditions carefully before ordering any services from rain transfer, rain transfers we or us ). in particular, we draw your attention to clauses 14 (availability of the services) and 15 (liability). 1.2 by ordering any services from our web site, you agree to be legally bound by these terms and conditions of use as they apply to your booking. these terms and conditions apply to all services supplied by us to you. 1.3 if you do not wish to be bound by these terms and conditions then we regret that you cannot book any services via this website. 2.1 our web site is for you to select and order a transfer service to take you to and/or from your holiday resort, from and/or to the resort airport. our web site describes our services in full detail. 2.2 please note that the contents of our web site are aimed only at users aged 18 and above, and you must be 18 years or over to purchase our services, using the payment method displayed on our web site. 3.2 rain transfer is entitled to refuse any booking made by you. if your booking is accepted, we will confirm acceptance to you by online electronic means to the e-mail address you have given us upon booking. with the exception of clause 5, the order will then be fulfilled on the date set out in the confirmation. 4.1 details of our prices, and the procedures for payment and delivery are displayed on our web site. the price of all our services is the price displayed on our web site at the time and date of booking. we do our best to ensure that our prices displayed on our web site are accurate but the price on your booking will need to be validated by us as part of the acceptance procedure (see clause 3.2 above). we will inform you if a service's correct price is higher than that stated in your order and you may cancel the order and decide whether or not to book the service at the correct price. 4.2 prices quoted are per vehicle - except in the case of shuttle transfers where per person rates are quoted. each passenger is entitled to carry with them one standard-sized suitcase or holdall and one piece of hand luggage of a similar size as allowed by airlines. further luggage may be carried at the discretion of our driver but please note that this may be subject to a further charge for which you will be liable at the time. please contact us prior to travel if you are travelling with golf clubs, electronic wheelchairs or any other exceptional item as a larger vehicle size may be required. 5.1 we will use all reasonable efforts to ensure that your transfer collects you from your collection point at the time set out in your confirmation. however, we will not be liable for any loss or costs you suffer or incur through any reasonable or unavoidable delays and it is your responsibility to ensure that you book the transfer to collect you in acceptable time to travel to the airport ahead of check in. we will not be responsible for any losses you suffer (including for example any missed flight) due to you failing to allow sufficient time for your journey. 5.2 if your outbound flight is delayed, your service will automatically be amended and your transfer will collect you at your revised time of arrival. 5.3 if your outbound flight is diverted for any reason, we will endeavour to rearrange a transfer to collect you from your original destination airport at the revised landing time. (in a situation where we are notified too late to prevent our driver from traveling to the airport or waiting for your scheduled arrival time, you may have to book another transfer and pay additional charges locally). 6.1 if your flight is diverted, we recommend that you contact our 24 hour helpline as soon as possible who will book another transfer for you at a discounted rate. please note that, subject to their terms and conditions, it is the responsibility of the airline to transport you to your original destination airport. 6.2 all bookings made for transfers from resort to the relevant airport must be confirmed by our local office at least 24 hours prior to departure from resort. it is your responsibility to confirm your booking and if confirmation is not received or made we cannot guarantee that the service will be provided and we will not be liable for any additional costs or losses you may incur in this situation. 6.3 it is the customer's responsibility to travel with their booking confirmation. this contains arrival instructions (which differ in each airport), our local contact numbers in the event of an emergency and local office reconfirmation hours and contact number(s). this emailed to you upon completion of booking. rain transfer accept no responsibility or compensation claims for any loss of service should the customer not travel with their booking confirmation. 7.1 if you encounter a problem with the service provided, please inform our local office, or call us using the numbers given to you on the booking confirmation, and we will endeavour to put things right. failure to notify us of your complaint at this stage will affect our ability to investigate the matter under complaint, and your rights under the contract. rain transfer will endeavour to resolve all issues within 28 days of notification (if corresponding via post please allow extra time for unavoidable postal delays). 7.3 please note that any complaints must be received in writing by rain transfer within 28 days of the return booking date. (if an outbound transfer only - then within 28 days of this date). 8.1 if your booking details change, you can amend your booking up to 24 hours prior to your departure, subject to payment of any difference in the applicable prices in accordance with clause 4 above. we reserve the right to charge a 20% administration for any booking that is amended at any time prior to departure. within 7 days of the departure date 100% cancellation fees will apply and no monies will be refunded to you. 8-14 days prior to the departure date 50% of the cost of the booking will be charged. 15-30 days prior to the departure date 25% of the cost of the booking will be charged. outside of 30 days of departure a 20% administration fee per booking will be charged. 9.1 please inform us at the time of booking if any of the passengers are wheelchair users. please also inform us as to whether the wheelchair is collapsible, so that we can ensure that the correct vehicle is booked to meet your needs. children must use the correct child seat until they are 135cm tall or age 12 (whichever they reach first). they then must wear an adult seatbelt. it is the driver's responsibilty to see that children are restrained correctly. however, there is an exemption for licensed vehicles, which can still carry children even if the correct child seat is not available. children under three, if in a licensed taxi/vehicle may travel unrestrained in the rear if no child seat is available. for children aged three and above, they must use an adult seatbelt, if no child seat is available or taken. children aged 3 years and above always count as a passenger, occupy a seat and must be booked and paid for in full. children under 3 years of age may travel unrestrained (on an adult's lap) in the rear of a vehicle if no child seat is provided. however, will still count towards the vehicle occupancy. if customers choose to use or take a child seat, then the child must be included in the total number of passengers travelling, as a seat in the vehicle will be required. children aged 3 years and above always count as passengers and occupy a seat, and must use an adult seat belt if no child seat is provided. 11.1 please inform us at the time of booking if you wish to travel with access baggage including, but not limited to, surfboards, bicycles, pet carriers or other oversized items. this is to ensure that our vehicles can accommodate you. should you fail to notify us at the time of booking, you may be liable for any additional costs incurred in the carriage of such items. 12.1 we reserve the right within our reasonable discretion to terminate the transfer if you or your party display disruptive conduct or behaviour in any way and/or affect your own safety or that of the driver of the vehicle. we shall not accept liability for any extra costs incurred by you/or your party as a result of our doing so. 12.2 passengers are not permitted to take alcoholic drinks onto the vehicles for the purpose of consuming them during the transfer journey. we further reserve the right to refuse carriage to any person who is thought to be under the influence of alcohol or drugs. 13.1 for the purposes of the data protection act 1998 we, rain transfer, are a data controller. in order to process your booking need to collect certain personal details from you. in order to process your order we may share your information with our sub contractors or other involved third party or supplier. we will provide only the personally identifiable information necessary to ensure the successful fulfilment of your travel arrangements. the information may also be provided to security or credit checking companies, or as required by law. 13.2 we have appropriate security measures in place to protect the personal details you give us. your travel arrangements are to take place outside the european economic area, (eea), controls on data protection in your destination may not be as strong as the legal requirements in your own country. we will not however, pass any information on to any company and/or organisation not responsible for providing any part of your travel arrangements. where you provide us with personal details relating to any special requirements and/or details of any illnesses, disabilities or religious requirements, you consent to this information being passed onto any organisation or companies responsible for any part of your travel arrangements. if we cannot pass this information to the relevant suppliers, we cannot process your booking. 13.3 we are entitled to assume you do not object to our doing any of the things mentioned above unless you tell us otherwise in writing. you are generally entitled to ask us (by letter or e-mail) what details of yours are being held or processed, for what purpose and to whom they may be or have been disclosed. we will charge a fee to respond to such a request. please email us at info@raintransfers.com. in limited circumstances we are entitled to refuse your request. except where expressly permitted by the data protection act 1998, we will only deal with the personal details you give us as set out above unless you agree otherwise. 14.1 our web site is controlled and operated by us from our offices in marmaris, turkey. 14.2 rain transfer accepts no liability for any costs, losses or damages resulting from or related to the purchase or attempted purchase of a service by persons located outside of the united kingdom, the republic of ireland, the netherlands or the united states of america. 14.3 we have used our best efforts to ensure that our web site complies with united kingdom laws. however, we cannot confirm that the services or the materials on our web site are appropriate or available for use in locations outside of the united kingdom. to the extent that local laws override any provision of these terms and conditions, the relevant provision shall be deemed amended to comply with such law or, to the extent that such amendment is not possible, the provision shall be deemed stricken and the remaining provisions shall continue with full effect. 15.1 if the service delivered is not what you ordered or is not performed with reasonable skill and care due to the fault of our employees, agents or suppliers, rain transfer will refund to you the price paid and, if the service is not performed at all, we will refund to you the price paid together with your reasonable costs incurred due to the failure. this is subject to clauses 15.2, 15.3, 15.4, 15.5, 15.6 and 15.7 below. 15.2 we accept responsibility for death, injury or illness caused by the negligent acts and/or omissions of our employees or agents, our suppliers and sub contractors whilst acting within the scope of or in the course of their employment in the provision of the service. please note however that we will not be liable for any injury, illness or death or consequent losses suffered by you or any member of your party where such injury, illness or death was not caused by lack of reasonable care/skill on our part or that of our suppliers in performing our obligations under the contract. we will accordingly pay to you such damages as are applicable in such circumstances under turkish law. an event or circumstance that we or the supplier(s) of the service in question could not have predicted or prevented. this may include (but is not limited to) an occurrence of force majeure as described in these booking conditions. 15.4 the services are provided to you for private domestic use only and this is a consumer contract. accordingly, we accept no liability for any business loss (which includes without limitation any loss of contracts, loss of profits, loss of revenue or loss of anticipated savings in expenditure or any loss or corruption of data) however caused, even if foreseeable. these exclusions do not apply to any liability we may have for death or personal injury resulting from our negligence and for which our liability is unlimited. 15.5 if we are liable to you for any reason, our liability will be limited to the direct costs you incur which are a foreseeable consequence of our failure. this limit does not apply to any liability we may have for death or personal injury resulting from our negligence and for which our liability is unlimited. 15.6 we promise that all services you purchase from our web site will be performed with reasonable skill and care and, as far as reasonably possible, in accordance with our agreement. we will do our best to ensure that all materials and information published on our web site are accurate, but regrettably errors do occur, and we reserve the right to rectify such errors before your booking is confirmed. 15.7 nothing in these terms and conditions affects your statutory rights as a consumer. 16.1 force majeure means that we will not pay you compensation if we have to cancel or change the service because of unforeseeable circumstances beyond our control. these an include for example, war, threat of war, terrorist activity and its consequences or the threat of such activity, riot, the act of any government or other national or local authority, industrial dispute, natural or nuclear disaster, fire, adverse weather conditions. 17.1 if you wish to rely on any variations to these terms and conditions, you should ensure that such variations are agreed with us in writing as soon as possible. 17.2 we may transfer or subcontract any or all of our rights and obligations under these terms and conditions at any time. 17.3 we may alter these terms and conditions from time to time and post the new version on our web site, following which all use of our web site will be governed by that version. you must check the terms and conditions on the web site regularly. the terms governing the purchase of any service will be the terms in place at the time of your order. 17.5 a person who is not a party to our agreement has no rights under the contracts (rights of third parties) act 1999 to enforce any term of this agreement but this does not affect any right or remedy of another party which exists or is available apart from that act. 17.6 if any provision or term of these terms and conditions shall become or be declared illegal, invalid or unenforceable for any reason whatsoever, such term or provision shall be deleted but all other terms will remain valid. 17.7 these terms and conditions and your use of our web site are governed by the laws of turkey, and in the event of any dispute under this contract, you agree to submit to the exclusive jurisdiction of the turkish courts. 17.8 failure by either party to exercise any right or remedy under this agreement does not constitute a waiver of that right or remedy. 18.1 all notices shall be given to us via email at info@raintransfers.com or to you at either the e-mail or postal address you provide during any ordering process. 18.2 notice will be deemed received when an email is received in full (or else on the next business day if it is received on a weekend or a public holiday in the place of receipt) or 48 hours after the date of posting.